I am stressing this intellectual independence from Rome - both Empire and papacy - because it brings me to the main point I want to make, which is to do with what I've called in the title to this talk 'the practise of painting' - but it really refers to the visual arts in general. This is that the difference over veneration of images expressed in the Opus Caroli and in the canons of the Seventh Ecumenical Council was not just a matter of a misunderstanding due to the bad translation of the Council's texts; nor was it a straightforward intellectual or theological disagreement like the disagreement between the Council of Hiereia and Nicaea II. Nor was it even just a matter of politics, important as the politics were. It was also the result of a profound cultural difference, pre-existent to the intellectual quarrel, a disagreement as to the very nature and function of the visual arts. And this is a difference in principle that continues at least into the twelfth century. The point can be made very simply by comparing for example a painting of the virgin from the island of Naxos, usually ascribed to the seventh century and therefore before the iconoclast period, with St Mark from the seventh or eighth century Book of Dimma. 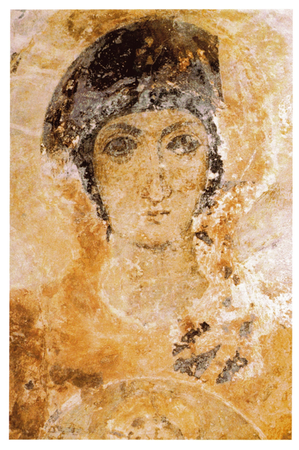 [Fig 3] Detail from a 7th century (pre-iconoclast) mural, Panayi Drosiani, Moni, Naxos. Myrtali Acheimastou-Potamianou: Byzantine Wall Paintings, Athens Ekdotike Athenon, 1994, p.34. 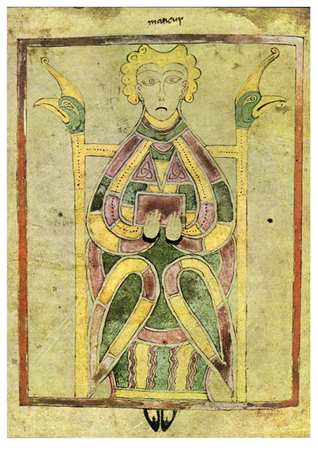 [Fig 4] St Mark, Book of Dimma (c.8th century), TCD Library Ms 59, St Mark. The point I want to make seems to me to be very obvious but, without claiming a very comprehensive knowledge of the literature, I have not seen it made except in various of the writings of Albert Gleizes. Both paintings can be described as beautiful. The first tries to convey the beauty of a person whom we might, if we are very lucky, meet coming down the street. The second has a beauty that is more intrinsic to the act of painting. The figurative elements - arms, knees, book, chair - are, so to speak, pretexts for a construction of curves beautifully organised within a rigorous rectangular frame corresponding to the overall format of the page. Of course I am not suggesting that insular art - the art of Ireland and of northern England and southern Scotland - is the same thing as Carolingian art, but insular art enjoyed a high level of prestige in Carolingian Europe. Alcuin, Theoldulf's older rival as educational theorist of the new Christian commonwealth, was a product of this culture. The areas of Germany that were being evangelised by Irish and Northumbrian missionaries were principle areas of expansion for the Frankish kingdom. And a number of the most important scriptoria producing insular style manuscripts were situated in territory under Frankish control, notably Echternach in modern day Luxemburg, granted by Pippin II to the Anglo Saxon missionary, Willibrord, in 700.